The 2019 National ESEA (Elementary and Secondary Education Act) Conference will be held at the Kansas City Convention Center in Missouri, January 30 - February 2. If you’re attending, swing by exhibit #815 on Thursday and Friday to say hello! You’ll get hands-on experience with ST Math while speaking with members of our MIND team. 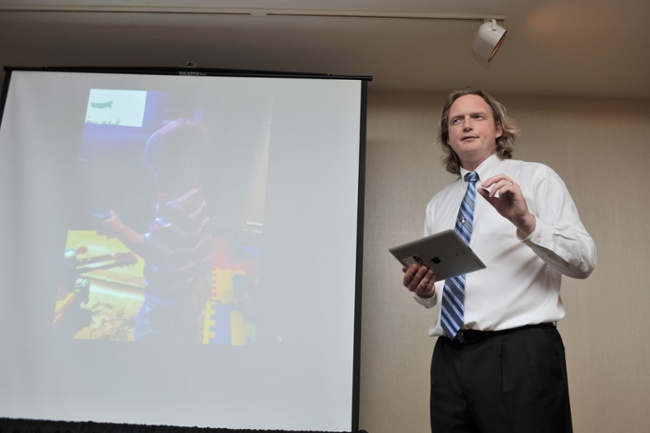 MIND’s Vice President of Content Creation, Nigel Nisbet, will be presenting at the conference on Thursday, January 31. Nigel Nisbet presenting on what it's like to learn math in a different language. Session Overview: Advances in brain research have moved educators closer than ever before to teaching math the way the brain actually learns. Journey with MIND Research Institute’s Vice President of Content Creation, Nigel Nisbet, to uncover a neuroscience-based, unifying theory that promotes deeper engagement, deeper thought and deeper learning. He’ll share insights on how our brains learn and how to create active classroom environments that foster student success in the 21st century. We hope to see you at ESEA at the end of the month! There’s still time to register at eseanetwork.org/conference. If you can’t make it to the conference, you can still keep up with the fun on Twitter at @MIND_Research and @nigel_nisbet. Follow all the ESEA action @ESEA_network and by following the hashtag #ESEAConference.